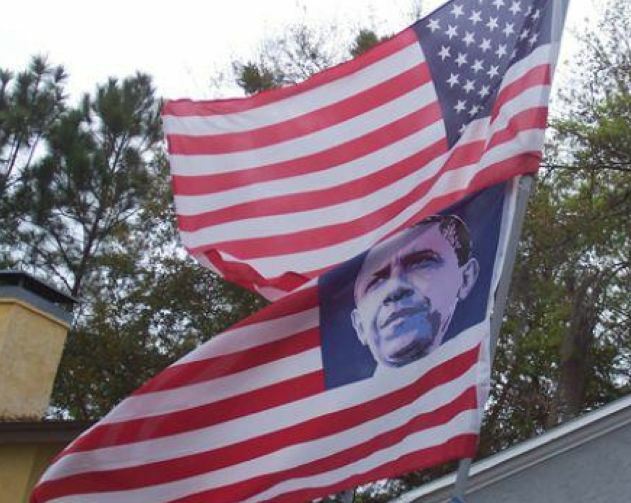 Veterans Demanded That Flag With President Obama's Face be Taken Down From Florida Democratic HQ-Truth! - Truth or Fiction? Veterans Demanded That Flag With President Obama’s Face be Taken Down From Florida Democratic HQ-Truth! A flag flown outside a Democrat headquarters in Florida displaying President Obama’s face in area where 50 stars would normally go has sparked outrage from veterans and citizens. The flag was flown just below an American flag. a Florida’s Lake county Democrat headquarters, according to a March 14, 2012 Fox News article. The flag was given to the office as a gift but was later taken down. The veterans offered the office a POW/MIA flag to display under the American ensign but it not known if the Democratic office is flying it.